Voldemort was dead. However, Harry Potter seems to be always alive despite the book and the movie is over. But there is the latest news about Harry Potter and his friends. let’s take a look! Harry Potter mini movie is being made today! However, do not expect this film will be in theaters muncup. Mini movie was planned to be a part of a new ride at the park playing The Wizarding World of Harry Potter in Orlando, USA. This film will be screened in the playground of the new Harry Potter, which is located in California, opened in 2014 and in Japan, opened in 2016. For the making of this film, some of the cast to join again. Is Daniel Radcliffe, Emma Watson, and Rupert Grint will join filming for this mini movie? Apparently the cast and story of the film is still a secret! Dated December 15, 2012 and then, a Harry Potter store officially opened. 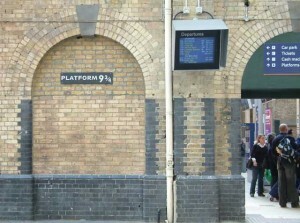 The shop is special because it is located near platform 9 3/4 at King’s Cross Station, London, England. The inauguration was done Warwick Dvis store. He played three characters at once in the Harry Potter films, Professor Filius Flitwick, Griphook, and the goblin bank Gringotts Leader. Whatever is in store platform 9 3/4? A variety of specialty items Harry Potter. There is a magic wand, uniform every dorm at Hogwarts, the Triwizard Cup, all the Horcrux, Voldemort, inverting the time, and so on. There is also a sweater reading “Platform 9 3/4″ which is very rare.